Industry spent $33.4 billion on product development, but of more than 1,200 makes and models developed, only 11.6% of them achieved positive return on capital. HOUSTON, TEXAS, UNITED STATES, February 11, 2019 /EINPresswire.com/ — The Global Wind Energy Innovation Trends research report reveals that over the past 40 years of the wind industry’s development, wind turbine manufacturing companies have spent $33.4 billion on product development. That investment has led to the deployment of more than 390,000 wind turbines globally. 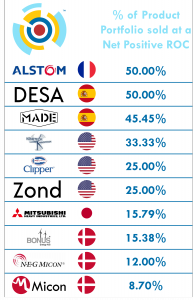 However, most wind turbine OEMs have a less that 50% net positive return on capital out of every product sold. This calculation is based upon the non-recurring engineering spent on product development, the CapEx expenditure on manufacturing tooling as well as other associated commercialization costs. We’ve also used typical gross margins and sale prices in global markets to calculate these figures. 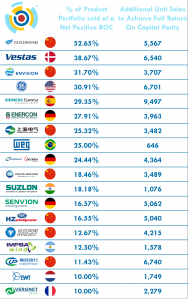 As a result, the industry is likely to see another round of consolidation in the supply chain before the year 2023 due to the increased pricing pressures which the turbine OEMs face. These pressures are partly the result of the loss of permanent subsidies in many markets around the world as well as the growing price competition from auctions / tenders in these international markets. Additionally, increasing CapEx costs for new product development are introducing a competitive pressure and facilitating the M&A deals between OEMs. The net cost for bringing a 10kW turbine to market is significantly less than a 5.0MW turbine. Therefore, not every turbine manufacturing company is well capitalized and has the balance sheet strength to be able to compete by bringing new products to market as a result. Your average 4 – 5MW onshore wind turbine designed from a “clean sheet of paper” would normally cost approximately US$120 – 150 million to bring to market depending on the drivetrain architecture, electrical system, etc. This includes the R&D cost for a new product development program, the costs associated with prototyping, testing and certification, as well as the costs for supply chain buildup in the sub-component sourcing.